Logitech launches £80 Clock Radio Dock | What Hi-Fi? 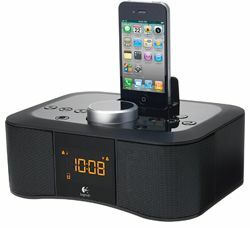 Logitech has launched the Clock Radio Dock S400i, a feature-packed system aimed squarely at your bedside. Equipped with an iPhone/iPod dock, FM radio, clock and alarm. There are dual alarm settings, a snooze button and a remote control. The S400i works with all generations of the iPhone, the iPod touch, iPod nano and the 6th-generation iPod classic. There's a 3.5mm audio input for connecting other music portables. The Logitech Clock Radio Dock S400i is out now priced £80.